This soup is quickly becoming a permanent fixture in my repertoire of dinners that can be prepared and put on the table in less than 20 minutes. The original idea for this recipe is based on a green pea soup with cheese that I found in a Nigella Lawson cookbook quite a long time ago which I have tampered with out of necessity several times (most often due to the fact that I am somehow, against all odds, out of cheese at the particular moment I would like to make the soup.) Due to the seasonable nature of asparagus you can very easily go without, there’s just something about the grassiness of asparagus that brings out the mild sweetness of the peas and the deep licorice essence of fresh basil. 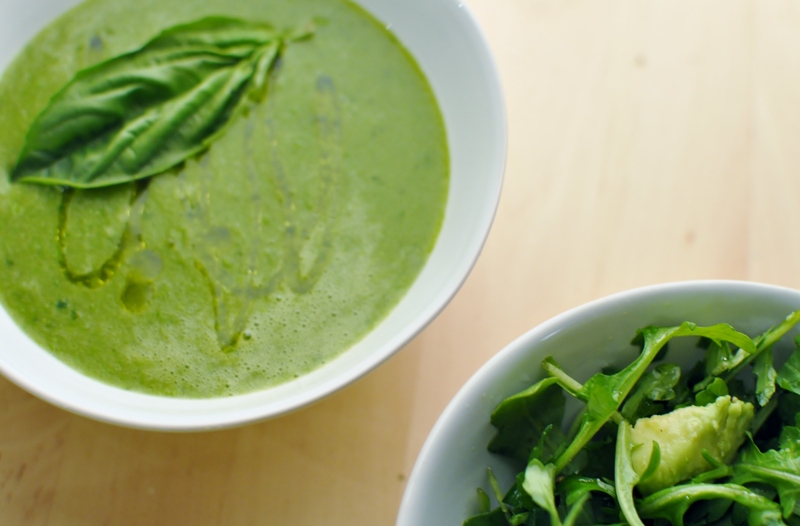 You can serve this quick green pea and asparagus soup with leftover quiche, spinach and ricotta quesadillas, or on its own out of a large mug if you don’t want to go to the trouble of preparing the lemony avocado and arugula salad. Bring the stock to boil in a large pot and cook the peas and asparagus until they are both just cooked, about 3-5 minutes. Stir in the fresh basil and salt. Being very careful not to burn yourself blend the soup with a hand blender right in the pot or in small batches in a regular blender. Serve garnished with a fresh basil leaf and a drizzle of olive oil. Combine all the salad ingredients in a bowl and toss gently to coat, serve immediately. As a solution to Christmas insanity in the cheese selling world and a form of self-preservation I have found myself listening exclusively to electronic downtempo music outside of work, whether it be while cooking, running, walking around doing errands, etc., etc. Most of the music off of The Avalanche’s Since I Left You is like a sunny Caribbean vacation, lush and loud and kinetically energetic. Etoh is a nice distance from that type of songwriting energy, thickly sound layered and introverted music for times when that sort of escapism is welcomed with open arms.